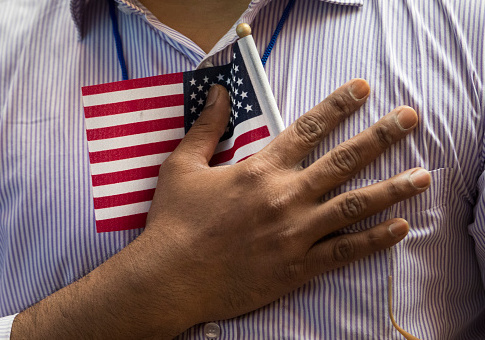 The key trick of Reihan Salam's new book, Melting Pot or Civil War?, is that it neatly bridges the yawning partisan gap on immigration using issues that concern both sides. We can have social equality and solidarity, Salam argues, or we can have immigration; we cannot possibly have both. Salam's pedigree well-qualifies him to cross the chasm. On one hand, as the executive editor of National Review, he carries impeccable conservative credentials. On the other, being the son of Bengali immigrants who grew up speaking his parents' native tongue at home, he says many expect him to be something of an immigration dove. One suspects that it is this combination of views that leads to Salam's thoughtful, measured conclusion that America in the 21st century needs to rethink how many and what sort of people it lets cross its borders. There are more immigrants in the United States today than at any previous point—43 million, about 13.5 percent of the population. That population has grown steadily since 1965, swelling through multiple attempts at reform. This growth implies a rebalancing of the American economy. 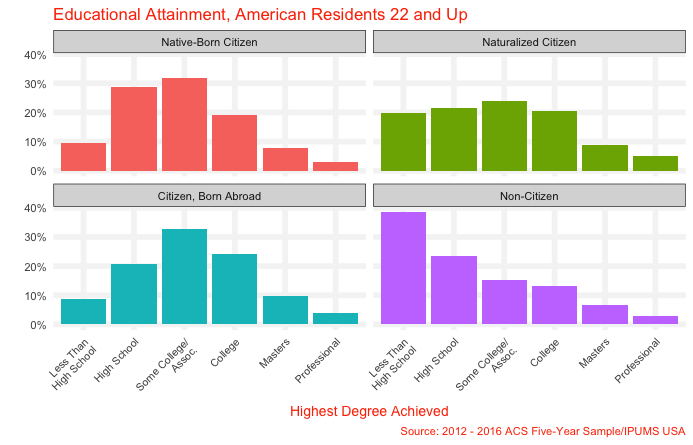 Data from the U.S. Census Bureau show that the noncitizen resident population is substantially less-skilled than their native-born and naturalized counterparts. This of course is not a byproduct of any innate inferiority of immigrants. Rather, it is because those with the least to gain at home are also the most likely to seek a better life in the United States, and because our immigration system selects for immigrants based primarily on family relationship, rather than educational attainment. Still, the aggregate effect is remarkable. The most striking thing about the above chart is not the high numbers of low-skilled immigrants. Instead, it is the different shapes of the skill distributions. Citizens—native-born and naturalized—have a roughly normal distribution. The noncitizen distribution, by contrast, is heavily right-skewed. It is this combination—the rising immigrant population and its low-skill skew—that concerns Salam. What happens, he asks, in a country with a large, low-skilled population, especially when that group is excluded from the rights and privileges of citizenship? There are two answers. The first views the influx of low-skilled workers as an unqualified boon, with cheap labor increasing productivity and thus GDP. The natural conclusion is that totally open borders would allow the United States to pick up the unclaimed "trillion dollar bills on the sidewalk" made available by unencumbered migration of labor. This view has long had its boosters on the left and the right. It will make America better off, they contend, by maximizing GDP, which can then be redistributed to needy citizens. Upon the tide of free immigration, all ships will be lifted. Salam is not so sure. Unlike other critics of unrestricted immigration, he does not focus on the adverse impacts of low-skilled arrivals on the least-educated of America's native-born citizens. Rather, he asks, what actually happens to our society when we try to make it rich off of cheap labor? There are, he points out, countries that far more efficiently extract value from their immigrants than we do. Consider Qatar, where 74 percent of the population are foreign-born workers living as de facto slaves. Or Singapore—a mere 43 percent immigrant—where a noncitizen woman will be summarily deported if she gets pregnant. In both places, large immigrant workforces are used to create stable lifestyles for citizens at the expense of noncitizen labor. Such conditions are a product of what Salam labels "extreme between-group inequality," in which "disadvantaged groups can justly claim unfair treatment, and advantaged groups are keen to protect their status." This is a natural byproduct of the bifurcation of society mass immigration facilitates. The skilled, powerful top half of the distribution benefits, while the bottom half is kept in servitude by their lack of skill and systematic disenfranchisement. Salam thinks this configuration is unsustainable in America. This is especially because, while first-generation immigrants may be simply happy to make more than they did at home, their children will not be. "As someone born and raised in neighborhoods transformed by low-skill immigration," he writes, "I can confirm that: ‘You're better off than you would have been had you been born in the Third World!' is not a satisfying riposte. ‘Gee, thanks. I also can't afford my rent.'" The dissatisfaction of second-generation immigrants—and subsequent backlash from the entrenched native-born "upper" class—is what will lead to Salam's predicted "civil war." This restructuring, Salam argues, would shore up the center of the skills and income distribution, while at the same time spurring innovation to let machines do much of the low-skilled work. This would produce a "more egalitarian economy," in which "workers enjoy middle class stability" and which "would help heal our country's ethnic divide." Concerns about "extreme inequality" and creating a "more egalitarian economy" are strange to hear from a conservative commentator. But Salam's purpose is more than just preventing income inequality as an evil per se. Rather, he understands that inequality of the sort he describes eats away at social solidarity, driving society apart. It produces exactly the imbalances of power that he sees in nations like Singapore and Qatar and that he would like to avoid in the United States. Inequality matters not because it is intrinsically unjust, but because an ethnically or socioeconomically unequal society can never be the kind of republic envisioned by the founders. Insofar as open immigration leads to bifurcation, Salam sees immigration restriction as a way to reempower the middle of American society, while simultaneously allowing the immigrants who are already here to slowly join it. Economically, this would require a step back from welfare-state neoliberalism. No longer able to rely on the immigration engine to boost GDP, policymakers will need to ensure equitable growth through a different historical model, making sure workers' wages rise steadily (a shift that will be facilitated by fewer foreign-born competitors). Immigration has become such a wedge issue that Salam's basic reasonableness is a welcome breath of fresh air. If for no other reason, the book is worth reading for the author's clear commitment to finding a compassionate, functional immigration compromise, rather than doing what each side's most vociferous voices want. At the same time, Melting Pot or Civil War? is most valuable not as a policy proposal, but as a warning. Along innumerable axes, America is coming apart. We can continue to skirmish over immigration, Salam argues, but we do so at our own peril; far better a program which, though it curbs immigration, lifts everyone up in the process. This entry was posted in Culture and tagged Book reviews, Immigration. Bookmark the permalink.